Acne is a common skin condition that mostly affects teenagers, but also adults are prone to it. Due to the changing lifestyle, unhealthy food habits and pollution the prevalence of acne in young adults has increased. Acne face is no less than a nightmare. The unsightly breakouts on the face, back, chest and arms cause pain, and if left untreated leaves scars. Acne hampers your beauty and self-confidence. If you visit a dermatologist, you will be prescribed ointments and drugs. However, there are many reasons to avoid conventional treatment such as sensitive skin, personal choice, allergy but the topmost is that chemical treatments or prescription drugs for acne do not address the cause and so the effect is temporary. Also, harsh chemicals may exaggerate your problem and irritate your skin. Essential oils are natures gift to treat most of the skin issues and are safe alternative to chemical loaded and harsh conventional acne treatment. The primary cause of pimples and acne are bacteria on the skin, excess oil, clogged pores and accumulation of dead skin cells. Other factors include poor diet, stress, hormonal imbalance and certain medications such as birth control pills, androgens, lithium and corticosteroids. Essential oils are antibacterial, antiseptic and anti-inflammatory. They heal the skin, unclogs the blocked pores and exfoliates the dead skin cells. Being anti-inflammatory, they relieve pain and redness. The best part is that essential oils are gentle over the skin and tackles the root cause. The benefits of essential oils for skin goes beyond fighting acne and promotes skin health by providing essential nutrients to the skin. Also, they alleviate stress, balances the level of hormones and fights insomnia. Tea Tree Oil- Tea tree oil is potent anti-bacterial, anti-inflammatory and antiseptic. It kills the acne-causing bacteria, exfoliates dead skin cells, removes impurities and unclogs the pores. Application of 5% Tea tree oil is as effective as 5% benzoyl peroxide. It may work slowly, but in comparison to benzoyl peroxide, it is less irritating. Also, research proves that tea tree oil is more effective than placebo in minimizing the acne severity and number of acne lesions. Application of tea tree oil two times a day for 45 days alleviate acne symptoms and acne severity. Mix 15 drops of tea tree essential oil to 50 ml witch hazel oil. Apply the solution to the affected area with the help of a cotton ball two times a day. Leave it overnight and in the morning wash your face. You may also add a few drops of tea tree essential oil to your regular face wash and use it. *Do not apply tea tree essential oil on your skin for more than two times a day. Overuse will make your skin dry and trigger oil production. 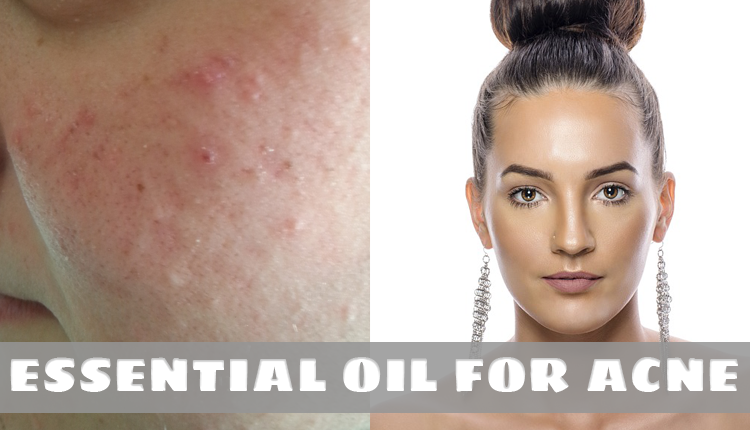 Frankincense Essential Oil For Acne- The astringent property of frankincense essential oil makes it an effective acne treatment. It dries out the acne, tightens the skin, promotes wound healing and reduces scars and dark spots. Also, frankincense essential oil helps the collagen production and growth of new cells. It keeps skin firm and elastic. Mix 4 drops of frankincense essential oil with four drops of tea tree oil and 15 ml rosehip oil. Store it in a dark glass bottle. With the help of cotton apply this oily mixture to the affected area two time a day. Bergamot Essential Oil- It is a citrus based oil that has antibacterial property and is also known to reduce stress. It is a wonderful ingredient to fight acne, reduce blemishes, promote healing, minimize scars and promote the growth of new cells. Mix 5 drops of bergamot essential oil with four tablespoons of aloe vera gel and two drops of lavender oil. Clean your face and apply the oily serum to your face as a moisturizer. Repeat this two times in a day. If stress is the trigger behind skin breakouts, pour a few drops of bergamot oil on your handkerchief and inhale it to lower the level of stress and anxiety. *Bergamot oil is phototoxic. Avoid stepping out in the sun after applying it or use sunscreen to protect your skin. Clary Sage Oil- Linalyl acetate present in clary sage oil reduces inflammation and soothes skin irritation. It regulates the production of sebum. Also, clary sage oil balances hormone and controls the growth and spread of the bacteria that causes skin infections. Research shows that this oil can reduce the level of cortisol and thus it improves mood. Dilute 1-3 drops of clary sage essential oil with a tablespoon of coconut oil or jojoba oil and apply to the affected area two time in a day. To combat stress, anxiety and insomnia diffuse five drops of clary sage oil. You can also add 1-2 drops of the oil to your face mask or face cream and use it. *Never use more than 1-2% of this oil on your skin and that too in diluted form. Lavender Essential Oil For Acne– Lavender oil is antimicrobial and antioxidant. It is known to nourish and soothe the skin. It heals dry skin, reduces blemishes or dark spots and nourishes the skin. It has mild astringent property and clears the clogged pores. Lavender essential oil is a circulatory stimulant. It enhances the blood flow to the skin. Increased blood flow means an increased supply of nutrients and oxygen. Your skin becomes healthy and glows. Also, lavender oil has relaxing effects. To 15 ml rosehip oil adds ten drops of lavender essential oil. Store the mixture in a dark coloured bottle. Clean your face and apply the oily serum to your face. Repeat this two times in a day. Alternatively, to a bowl of steaming water add ten drops of lavender essential oil. Place your face over the bowl and cover your head with a towel for 5-10 minutes. Let the steam cover your face. Do not wipe your face and let your face dry naturally. This is followed by massaging your face with ice cubes wrapped in a clean cloth for a minute or two. Do this every day for the best results. Juniper Berry Essential Oil For Acne- Not only juniper essential oil has antibacterial property but also has detoxifying properties. This magic oil eliminate the toxins and bacteria from our body rendering a clear skin. Add 2-3 drops of juniper essential oil to aloe vera gel. Apply to your face and leave it overnight. In the morning wash your face. Lemon Grass Essential Oil- The presence of citric acid in lemongrass essential oil makes it a natural exfoliant that eliminates dead skin cells and excess oil. Its natural healing property fades out the scars. Also, it reduces sun damage and dark spots. Being antibacterial it fights acne-causing bacteria. The astringent property of the oil unclogs the pores. To 15ml calendula oil add eight drops of lemongrass essential oil. Apply it to clean skin two times a day. Pure essential oil may irritate the skin so always use them in dilution. Do a patch test before using them. Pregnant women, nursing moms and for kids, please consult your doctor before using essential oils. Essential oils are the best treatment for acne prone skin. However, the results may vary according to the skin type. The outcome also depends on the severity of skin breakout. For apparent results have patience and be consistent with the treatment.